From hyperpigmentation during pregnancy, breakouts due to constant hormonal changes, the sun, and getting less good quality sleep, I can’t get away with a lazy approach to my skin anymore. I had terrible breakouts up until about 20 weeks pregnant with Olive, then it cleared up practically overnight. But it all came roaring back when she was born and I started breastfeeding. Now that she’s weaned herself (literally days before she turned one), my skin has cleared up a lot but I’m still having to work harder to get that glow! I take a natural approach to what I put on my body and it’s always been hard to get good, high-performing natural products that don’t cost a fortune. I’ve used Sukin a lot in the past because it is natural and inexpensive but it definitely hasn’t made any improvements to my skin concerns. But recently, a new store opened in Nobby Beach which fills a huge gap in the market for natural products. It’s called the Clean Beauty Market and they stock a wide range of hard-to-find non-toxic skin, hair, makeup and wellness brands, and do treatments as well. Recently, I had a hydro-microdermabrasion and it was amazing. It was so relaxing I’m pretty sure I fell asleep! And the best part was, it was completely customised to my skin. The facialist hand-picked every product used during the facial. The experience opened up a whole new world of skincare options to me and I’ve discovered some great products that my skin is loving. Just to note, I have true combination skin - it’s often oily and dry/dehydrated at the same time. My main skin concerns are breakouts, hyperpigmentation and dehydration. Santé Face Cleanser - I use this in the shower to take my makeup and/or sunscreen off. It just uses water to wash it all away. Meow Meow Tweet Face Cleanser - my skin loves this. 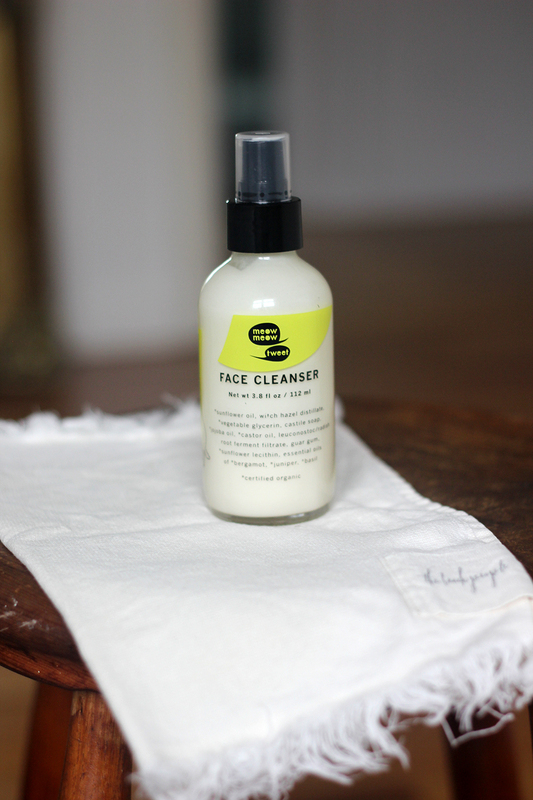 It’s very nourishing while lifting all the impurities away and giving my face a good cleanse. It leaves it feeling hydrated and doesn’t strip all the good oils away. 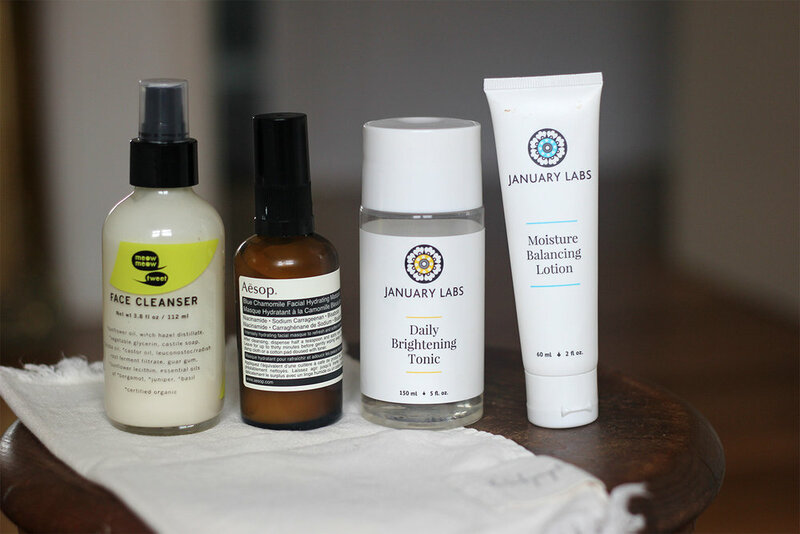 January Labs Daily Brightening Tonic - I don’t know how this stuff works but it’s amazing! It exfoliates and hydrates at the same time. When I wake up in the morning any redness or breakouts are significantly calmer and it gives my skin a lovely glow. January Labs Moisture Balancing Lotion - this does exactly what it says on the tube. It’s a lightweight moisturiser that hydrates without any greasiness. 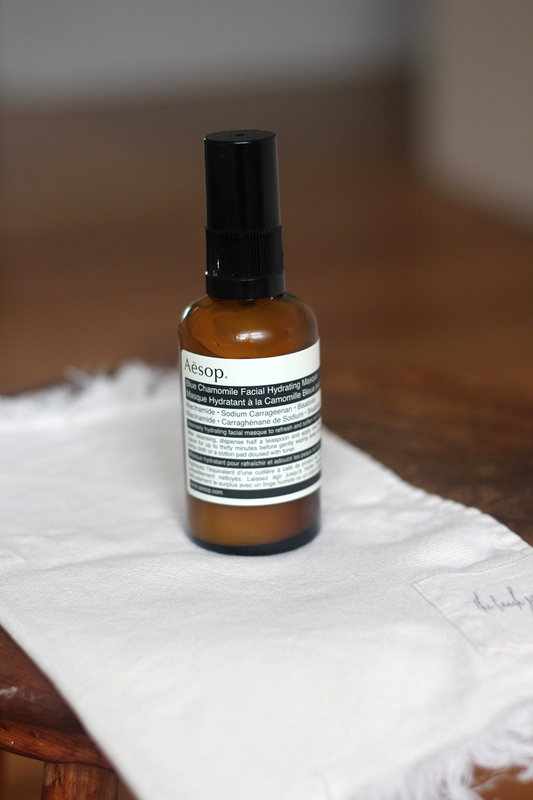 Aesop Blue Chamomile Hydrating Masque - I use this every second night as it’s such a lovely soothing burst of hydration. When I wake my skin looks glow-y and well rested.